Something extraordinary happens when you put on a kilt. Your shoulders settle as you let out a sigh of relief. Your body, now free from the constraints of torturous bifurcated confinement, relaxes. Your heart calms as the tension leaves your body. The lines around your eyes soften and a smile turns up the corners of your mouth when a cool breeze blows across your legs. In essence, you feel more free – both physically and spiritually – than you ever have wearing jeans or suit pants. This is what I want my woodworking to become – softer, less structured, more relaxed, more care-free. I want to enjoy the act of making whatever it is I make and not stress so much about having the exact measurements and the seamless joints. Don’t get me wrong – I don’t want to get sloppy in my work and end up with poorly made things that feel good! But I want to remove the paralysis I get from worrying about something being perfect. I want to be able to go in the shop, quickly sketch out some ideas, pick up some wood and a saw, and get to making the ideas a reality! At the other extreme, I don’t want to lose focus on the function as I abate my form. I’m not making useless objects for the sake of art. In the pursuit of my Art History degree, the semester where I had to take Contemporary Art was the worst one of my entire college career. I didn’t get it then and I don’t get it now. I have to maintain a ration of function, in addition to form, or else it doesn’t feel natural to me. So that is my angle on the subject and my approach to changing how I function in my workshop. Some of my posts are still going to be regular ol’ blog posts, but I hope to have quite a few mixed in that discuss the progression of my techniques and spiritual movement into what I think will be a better kind of woodworking (for me). Kilts are not for everyone! Our society is comprised of all walks of life, including those who are intolerant of life styles “different” from their own. So you have to have thick skin to wear a kilt out in public. You have to have a good sense of humor. And, sometimes, you have to have a good left hook. Buying and wearing a kilt is a very personal decision. It isn’t a gift that should be sprung upon someone. And it certainly isn’t something you should force or guilt someone into wearing. 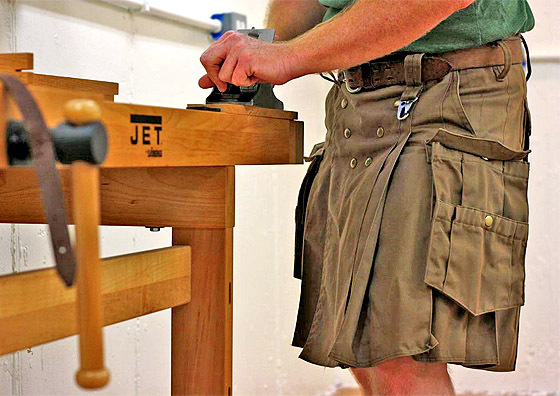 The kilts I wear in the shop are all cotton canvas material – not wool. I can’t imagine wearing a wool kilt and trying to keep it clean!! !